To commemorate the centenary of his birth, Woody Guthrie has been the subject of several projects in 2012 that contribute to maintaining the tradition of one of the great American songwriters of the Twentieth Century. 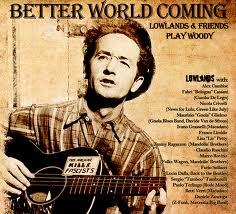 To demonstrate that Guthrie is not totally the domain of English speaking countries, Italian based roots rock band Lowlands have invited a selection of their friends to record a tribute album BETTER WORLD COMING which ensures the European markets are not left out of the celebrations. Lowlands are led by British born singer-songwriter Edward Abbiati and since their formation in 2008 have recorded a series of albums that have received favourable reviews from some of the genre’s esteemed publications. Amongst the host of guests invited to contribute to the recording is Jimmy Ragazzon, the leader of fellow Italian band The Mandolin Brothers who have recently been increasing their awareness in America and have had their latest album reviewed on this site. This Woody Guthrie project by the five-piece Lowlands and their many friends was recorded during a busy period for the band especially as they have an autumn release lined up for their next batch of original songs. The songs of Woody Guthrie really need no introduction and are in plenty supply especially as a majority of the ones Lowlands have chosen were not on the ‘very best of’ album released in this country a couple of years ago. Perhaps the bravest decision Lowlands made on this album was to not record the Guthrie classic ‘This Land Is Your Land’ in its simple format choosing to feature short piano clips of the tune as an intro and outro and sampling a portion of it in the track ‘Hard Travelin’. Whether this works is open for debate but the iconic unofficial anthem of the American working man surely warrants the utmost respect in any Guthrie interpretation. Of the other tracks chosen ‘This Train is Bound For Glory’, also featured on Pete Molinari’s latest piece of work, is a personal favourite. Most of the interpretations are fairly straightforward and give a little taster of the work of Guthrie. It’s difficult to recommend this collection of Guthrie appreciation as a must-have addition to your music library especially if his work is already there but there is certainly merit in Lowlands introducing the great man to uninitiated members of their fan base.